polybore: The single most useful tool for the blogger ever? Well it is for this blogger anyway. Ok this applies to boring old internet explorer. I know there are other browsers out there, and I have had a look at most of them, but I always go back to comfy old IE7. Polybore is stuck in a rut and it seems well and truly in Bills his clutches. Well, browser wise anyway. Another polybore weakness is atrocious spelling, well maybe thats a bit extreme, I can probably spell around 95% of the words of my vocabulary. The correct spelling of the mysterious missing 5%, and its always the same blasted words, just never stuck and continue to fail to stick in what remains of the polybore brain. 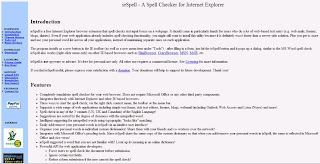 ieSpell to the rescue, it will check the spelling of any online form you happen to be filling in. A lot of forms these days do have spell checker functionality built in, but for those that don't ieSpell saves polybore's blushes. ieSpell simply plugs itself into internet explorer tools and context menus. Why not give it a go. Like much of my favourite software it is, of course, free.